Shri Mataji explains the meaning of becoming the spirit, the difference to other yogas, the inner force, the meaning of the Holy Ghost, how to become your own master or guru and how to feel the inner energy. Shri Mataji also points out the fact that we cannot pay for our spiritual growth. Furthermore she shows how our energy centers go into imbalance and thus becoming malignant, and how the inner energy put these centers right by connecting us the all-pervading power. Shri Mataji talks about her time with Gandhi, about the real baptism, how to bring ourselves into balance, about forgiveness and how to feel the all-pervading power in the hands. The journalist is surprised when feeling her own energy. Shri Mataji explains more about the subtle body, how to feel it, and what it means. The journalist is asking about one of her own health problems and Shri Mataji shows her, which center is affected and how to balance it. A report published in a magazine called Ziereus, May 1983. The writer, who met Shri Mataji before she visited the U.S.A., received his self-realization during the interview. The aim was to talk to Shri Mataji Nirmala Devi about her forthcoming North American tour. What happened was something that is only now, a week later, starting to make sense. I telephoned the number Shri Mataji’s followers in New York had given me, and found myself, an hour later, knocking on the carved door of a five storied terraced house in London’s classy Knightsbridge district. The door was opened by a young Indian who ushered me into a reception room as ornate and rich as a jewel box. Furniture covered with rose silk, tables inlaid with ivory, carved and gilded wooden screens, pale pink crystal chandeliers. I mumbled something about subtle energy centres along the spine. Shri Mataji then touched the red spot on her forehead. “It brings about a change in awareness. You feel it as a cool breeze, cool vibrations, you could say, on the top of the head and on the hands. It is an actual happening! Not self-certification. Not saying ‘I am born again!’ or ‘I am this or that!’ You actually become! If you desire self-realization and you get it, then you become collectively conscious, truly sweet and truly diplomatic. A true blue American, you could say.” And the joyous laughter flowed into every corner of the room. Shri Mataji’s face became serious. “As far as I know,” she said, “I am the only one who can do it en-mass. “Could I receive this gift?” I asked. Shri Mataji’s eyes danced, “Put your hand above your head,” she said. I did as I was told. There was a faint, oh so faint coolness on my hand. I looked round to see if there could be a draught coming from anywhere, but there was no air conditioning and the windows were closed. At this point a wave of most pleasant well-being swept over me. It wasn’t a trance or a hypnotic state (I’ve experienced those) – it was a feeling of deep peace. I regretted my next question. It caused the smile to fade from Shri Mataji’s face. “It is part of evolution,” she replied. “It is a gift of love from God, who is the ocean of love, the ocean of compassion. How can you pay for that? God does not understand money. How can you pay for your evolution? Did you pay to stand up on two legs? Anyway, why would I want money? I come from a wealthy family. My husband is Secretary General of the United Nations International Maritime Organization here in London. I do not need money. 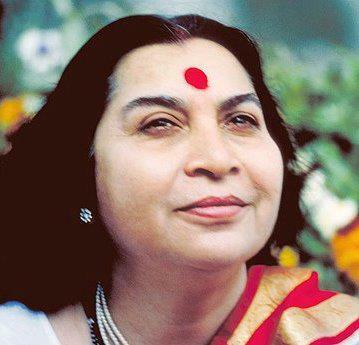 I do not accept money.” Shri Mataji let go of my hand and smiled.